It can be hard to think about buying a home when you are still paying off student loans. 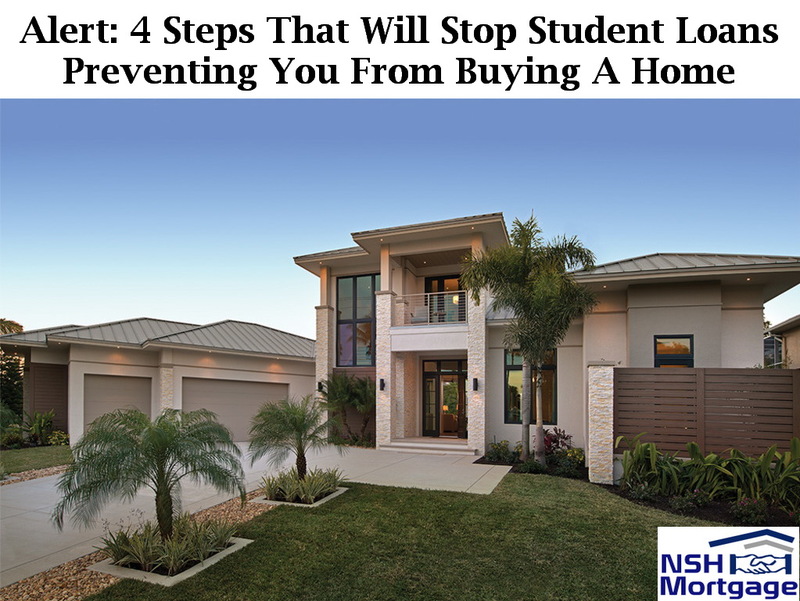 Here are four steps that can help you with student loans when buying a home. 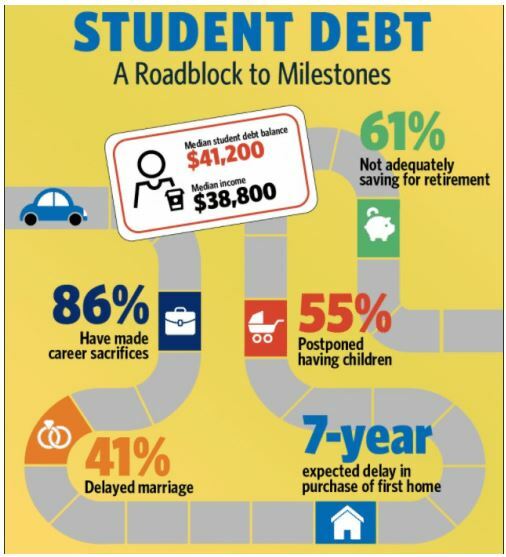 NSH Mortgage has the wisdom and tools that can help you stay ahead of your student loans. The idea of taking on more debt can be daunting, especially if you are far from the student debt payoff finish line. Typically, they carry a student debt loan ($41,200) that exceeds their annual income ($38,800). Only 20% currently own a home. Among the eight in ten who do not own a home, 83% feel their student loan debt has impacted their ability to purchase. 84% expect they will have to postpone purchasing for at least three years. In particular, seven years, is the median amount of time they expect you to have been waiting before you buy. Nearly 80% borrowed funds their education at a four year college. 32% had previously either been in default or forbearance on their loans. Jessica Lautz, NAR’s managing director of survey research and communications, says the report found that millennials actually have worse problems with student debt than earlier generations. In fact, 83% of people are saying their student loan debt is delaying them from purchasing. It means they are unable to save for a down payment. They also are not feeling financially secure enough because they are paying so much for their student loans. Also, it is good to note that buying a home with student loans does get easier for you in 2017. Lautz has noted to an alarming fact, that college loan balances for Americans has risen more than $833 billion over the last ten years, climbing to an all time high of $1.4 trillion. Robert Johnson, president/CEO of The American College of Financial Services, says it is harder for these millennials to qualify for home financing. Mortgage lending standards have gotten much more stringent since the financial crisis. With high levels of student debt, millennials simply cannot meet the new higher standards for mortgage debt. Another thing that makes it tough to get approved for a mortgage is a high debt to income (DTI) ratio, which many millennials suffer from. This metric is more important to lenders than the total amount you owe on student loans. DTI is a borrower’s total amount of recurring monthly debt payments, including credit cards, student loans, auto loans and mortgages, versus their gross monthly income. Lenders, which prefer a DTI lower than 43%, calculate this number using a special formula. First, they add up your total monthly debt obligations; this includes all loans and credit card payments, along with expected housing debt. In addition, it also consists of mortgage principals, interest payments, property taxes, homeowners insurance, and mortgage insurances. Next, they will divide your monthly debt amount by your monthly gross income. Be punctual with your payments. The higher your credit score, the more you can stretch income guidelines when you apply for a mortgage. Save as much as you can for the down payment. Many lenders require a minimum 20% down payment. If you can save even more, you can borrow less and this can help you in lowering your DTI. Move back home for a while. Among first-time home buyers, we found that the highest share move directly from a family member’s home into their own home. By living with mom and dad or a relative, you can pay down your debt faster and save quicker for a larger down payment. Check out a HomeReady mortgage. You only need 3% down, mortgage insurance is discounted and guidelines are more forgiving. Persuade a partner to pitch in. Get a co-borrower in on the deal. In addition, you should get a second borrower so you can decrease your DTI by bringing extra income into the application. Seek out a smaller home. The biggest problem for most first-time buyers is in purchasing more home that they can actually afford or need. Remember, the larger and more expensive the home, the bigger the mortgage payments, tax assessments, utilities, upkeep and repairs. You do not have to feel powerless about the fact that you have a student debt. Explore your options and take steps now to fast track your dreams of owning a home.